The expectation of many customers these days is to engage with business online, any time, often from a mobile device. If your onboarding process involves signing and scanning a physical form, these customers may skip you for an easier option. FormsByAir replaces traditional forms with smart, secure, online forms that work in any modern web browser, from mobile to desktop. Customers can apply while they're on the bus, autofilling common details like name, address & phone number, and even saving their progress to finish later on the same or another device. Simply replicating a traditional form in a web browser is selling online forms short. To make sure you get the most from software-based forms, we build them for you. Using a combination of human experience and our innovative platform, we transform paper, PDF and Word forms to smart online versions so that engaging with your business is as seamless as possible. But that doesn't mean you're paying for a software development project, we convert & build forms in hours or days for a fraction of what you might expect. Need to make an urgent wording change, add a question, remove a condition? No problem, after we've built your forms you get access to our online form builder to apply changes yourself, instantly. Need help with a more complex change? we're an email away. We also maintain a complete history of all changes so you can roll back to a previous version if things don't work out. This is where online forms start to diverge from their traditional counterparts. With software driving the questions, there's no need to present all possible options, no more "if you answered YES, skip to question 9"
Conditional paths directly reduce the effort involved in completing your forms by only prompting customers for exactly what you need from them, and nothing more. Here's another concept that works much better with software. Instead of bloating a form with space for a variable number of items e.g. applicants, groups can be dynamically repeated as many times as required, within limits you define. You can even link repeated groups, so a signature block at the end of your form will automatically match the number of applicants at the start. Dynamic validation gives customers instant feedback on their responses, making it easier for them to provide the right information. Validation can be as simple as a "required" question, to a minimum value or computational expression. We also support third-party validation services, for example, to verify identity. We make it easy for your customers to provide the right information by incorporating smart lookups to external services, for example, the NZ companies office, and we're adding more lookups all the time. An important part of supporting online commerce is the ability to capture electronic signatures in a legally acceptable manner. We do this by having form users physically draw their signature with a touchscreen or mouse within a secure web page, demonstrating intent to sign as well as providing proof of identity. We also capture the IP address and Useragent string of their device. 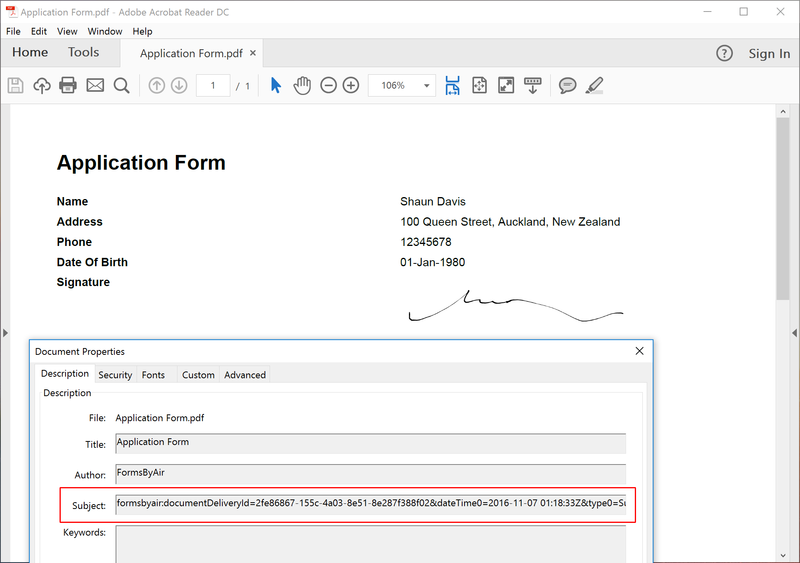 On submission we generate a permanent digital record in PDF format, embedding audit information and a unique identifier as metadata within the file. We then compute a SHA256 hash of the entire document, which we store, before providing the document to all parties for their records. We do not retain PDF files but can at any time compute the hash for a given document and compare it to the hash in our records to mathematically prove that the content, signature(s) and audit information have not been altered. Our implementation is compliant with ETA 2002 in NZ, ETA 1999 in Australia, ESIGN 2000 and UETA 1999 in the USA, and ECA 2000 in the UK. However, legality may be overridden in certain circumstances, for example, where there are formalities or customary practices around a particular trade or industry. As such you may wish to seek independent legal advice for your specific situation.